Dehradun is one of the most visited tourist attractions in Uttarakhand, mostly as a brief stopover en route Mussoorie. Located in the foothills of the Himalayan mountain range Dehradun is a striking yet serene place. It is thought to be one of the oldest (read as ancient) cities in India.Indications of Dehradun are available in the Epic Mahabharata as the city ruled by Rajguru Drona. It is quite natural that this mountainous place has many tourist attractions. 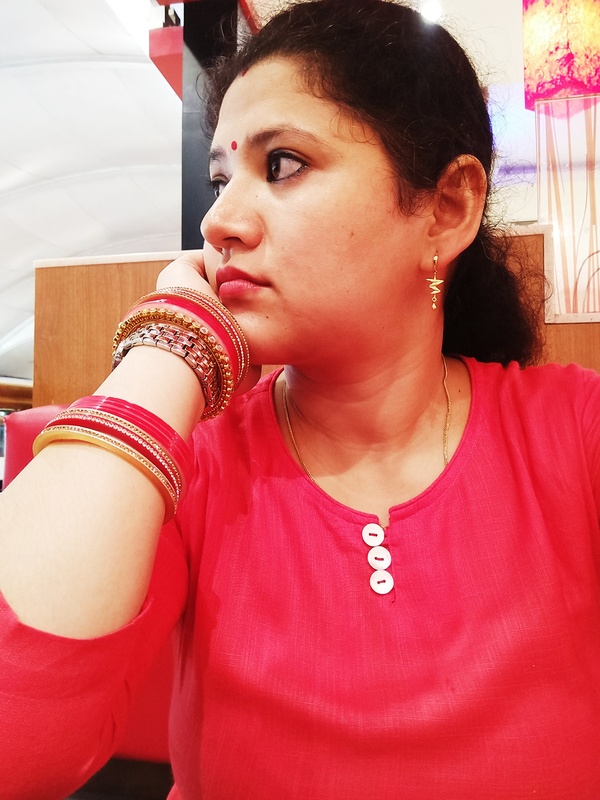 These tourist places include Sahastradhara, Malsi Deer Park, Robber’s Cave (Guchhupani), Lachhiwala, Tapkeshawar Temple, Laxman Siddh Mandir, Tibetan Mindroling Monastery, Sai Darbar and Santala Devi Temple. Though this list may not be exhaustive, it helps in shortlisting the important and must-visit places in the Doon valley. There are a lot of comfortable and cheap guesthouses and hotels providing outstanding lodging for the tourists. Read on to know more about these tourist destinations in detail. Forest Research Institute, spread over an area of about 2000 acres, was established in 1906. This beautiful estate is home to some of the largest and the best forestry research establishments in the world. The majestic main building of F.R.I. is an architectural marvel in itself. 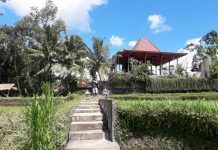 Built in Greco-Roman colonial style, this building includes six forestry related museums (on social forestry, pathology, silviculture, timber, non-wood forest products and entomology) which are very popular amongst the tourists. The estate also has a Botanical Garden which, with its sprawling lawns and colorful flowers, is a great spot for a day picnic. Also, located within this beautiful estate is Indira Gandhi National Forest Academy that trains probationer-trainees of the Indian Forest Service. Bird SanctuaryAsan Dam Wetland, also known as Dhalipur Lake, was created in 1967. This is a popular tourist attraction around Dehradun offering great opportunities for birding, water-skiing, boating and casual outings. Located by the water’s edge is also a refreshment café run by GMVN. Besides, Dehradun is also home to other prestigious institutions like Wadia Institute of Himalayan Geology (WIHG) and Wildlife Institute of India (WII). While WIHG is involved in conducting a host of researchers in the Himalayas, WII regularly conducts researches and training courses on wildlife. Malsi Deer Park, located in the outskirts of Dehradun, equally enthralls both the adults and children. 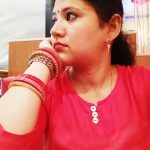 It is one of the major tourist attractions in the city and also acts as a savior of natural environment from unnecessary business propositions. It falls on the way to Mussoorie (with a little diversion of course), another highly rated tourist spot. 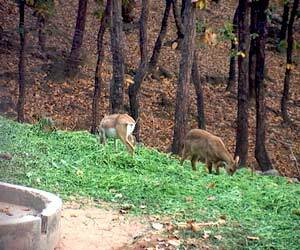 Malsi Deer Park is Zoological Garden based amidst the Himalayan vegetation and Shiwalik foothills. The place is full of sprightly young spotted deer breeds with a shy yet curious nature. More than once they will stare at you and when you go near them to take a better look or click a picture, they will just sprint away. Other than the Deers, there are beautiful peacocks enclosed in net cages for their fear of being poached. This reservoir also has a Neelgai, also known as the Indian Antelope. Since they are extremely rare and are on the endangered species list, it is a wonderful sight to see them in their natural environment. The park also has the Two-Horned Deer and a large population of different birds, making it an ideal place to have a mini picnic. The park authorities also have installed several slides to let the children enjoy while adults take a breather. They can also feed the different types of cute and cuddly rabbits. All these things make it a package for the entire family to go on an impromptu outing, the best part being they don’t have to carry snacks as the park has a small but resourceful canteen. Dehradun is a beautiful place with lots of picnic spots. Two of these are quite famous, namely Robber’s Cave (also known as Guchhupani) and Lachhiwala. Though they have different attractions to entice people, both these places are ideal examples of the treasures of nature in Uttarakhand. 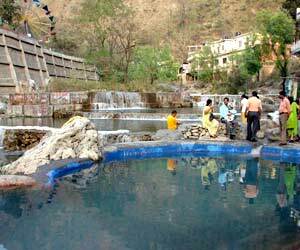 Guchhupani is basically a natural cave with an ice cold spring where erstwhile robbers used to hide from Britishers. Lachhiwala, on the other hand, is a picnic spot with just enough uncovered area amongst the forests with a river flowing nearby. Guchhupani or Robber’s Cave is located in Vijaypur near Anarwala, about eight kilometers from Dehradun Clock Tower. Since it is quite in the interiors of Anarwala village, one sometimes has to trek or take a sturdy vehicle to reach the place. This place as a picnic spot was established by the British Officials in the mid of their rule here. It is popular and is considered unusual because the freezing spring goes underground at someplace, reappearing a few meters away from the underground tunnel. This stream passes through cave, a natural rift in the mountains. Lachhiwala is also a famous outing destination between the locals. 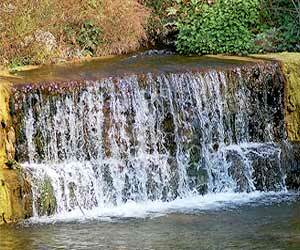 It is located just three kilometers from Doiwala and about 22 kms from Dehradun. The place is really serene and striking being absolutely untouched by any kind of commercialization. Though many people prefer to go only for the day but the government has set up a guest house for overnight visitors.One can take a dip in the Suswa River, pay their obeisance at the Laxman Sidh temple and then cook food in the open air for that extra thrill. The place is full of Sal (Shorea robusta) trees and anthills; the nearby forest also has monkeys so keep a check on you food items!! Sahastradhara is situated around 15 kms east of Dehradun Bus Stand in the state of Uttarakhand. The 9 m fall of water of Sahasradhara through the lime shelf unconsciously summons the visitors. It has an aged appeal and magnificence which only matches the healing powers of its waters. 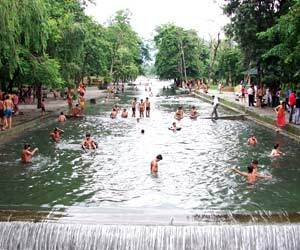 Sahastradhara also has a Sulphur spring near falls which has the medicinal properties and supposedly cures skin diseases or ailments. In addition to curing the skin disorders, the healing aqua also has additional restorative distinctiveness. Due to these properties of the waters, many people come here just to take a dip and then relax. Very near to the springs is located the Baldi River which is an ideal place for excursions and picnics with your family and friends. After the day out in sometimes chaotic and business prone Sahastradhara, a rejuvenating picnic near Baldi River would prove a welcome change for all. And since the river area overlooks the Sahasradhara, it turns out to be an ideal place to laze around in the splendor of natural world. Located in Dehradun, the Indian Military Academy is an institution that trains men who officer the Indian Army. The Indian Military Academy became functional from 1st October 1932 with batch of 40 Gentlemen Cadets. Brigadier L.P. Collins was its first commandant.The first course, christened as ‘Pioneers’, had on its roll great soldiers like Sam Manekshaw, Smith Dun and Mohammad Musa, all of whom went on to become chiefs of armies of their respective countries namely, India, Burma and Pakistan. For the purpose of Indian Military Academy, the government acquired the estate of erstwhile Railway College at Dehradun which had the appropriate buildings and a large campus, enough to meet the upcoming academy’s needs.The beautiful main building of IMA is called Chetwode Building. It is named after Field Marshal Sir Philip Chetwode, who was at the time of IMA’s inception, the Commander-in-Chief of India and had also inaugurated the new academy. Chakrata is a small town near Dehradun which served as an infantry base during the British rule. It is especially known for tranquil, beautiful and pollution free surroundings. The hill station is positioned between the Rivers Tons and Yamuna at an altitude of 5,500-6,500 ft. Strategically positioned near the banks of mighty River Yamuna, Dakpathar in Dehradun has recently been developed into a leisure spot. The brainchild of the GMVN (Garhwal Mandal Vikas Nigam), Dakpathar is naturally exotic surrounded with forests and bejeweled with lush green lawns and gardens. 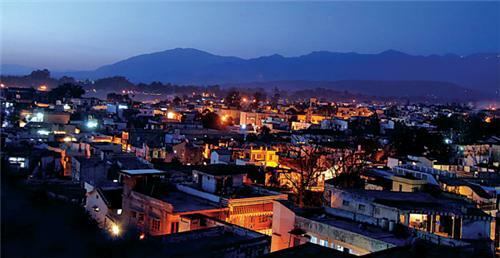 The capital city of Uttarakhand, Dehradun is famous for its scenic grandeur and beautiful surroundings. Dehradun and its surrounding places are adorned with the beauty of the Himalayas. There are several historical places, temples, natural springs, parks, picnic spots in the city’s vicinity, which are surely worth a visit. Next articleSecurity Screening Failure – Know the Consequences!